Elves & Angels has been making beautiful play kitchens, play stands and unbelievably sweet dollhouses for years, and their Maine Dollhouse is no exception. Huge and chunky, the Maine Dollhouse is perfect for young children because it is durable and sturdy. This dollhouse is also great for playdates or siblings as it was specifically designed as an open-concept house that can be enjoyed by several children at once. With nice open sides, low walls, and 6 large rooms, there’s a ton of creative play space available in this lovely house. Add to that the swooping graceful, flowing lines, and the warmth and beauty of native white pine, and you’ve got a gorgeous dollhouse addition for any playroom. This new Maine Dollhouse is made safely with real solid pine wood and a non-toxic linseed oil finish. Each dollhouse, like all Elves & Angels toys are shipped flat-pack in an effort to lessen the environmental impact of shipping. Elves & Angels has been making beautiful play kitchens, play stands and unbelievably sweet dollhouses for years, and their Maine Dollhouse is no exception. 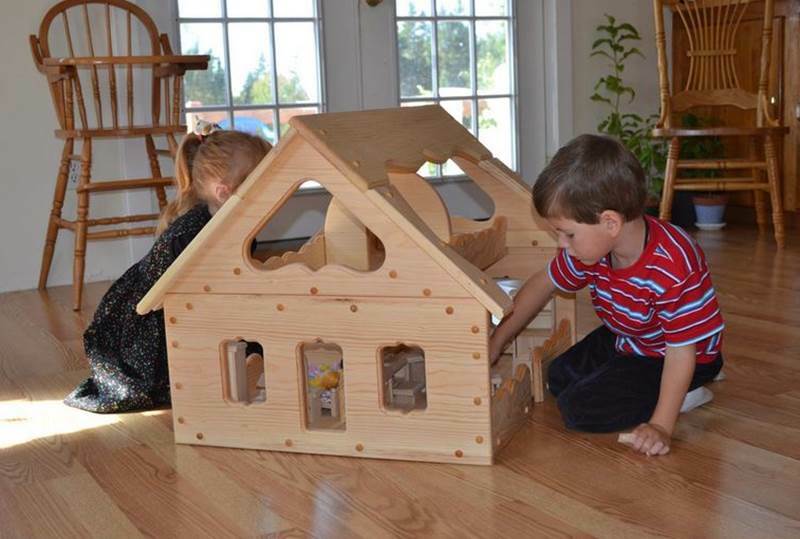 Huge and chunky, the Maine Dollhouse is perfect for young children because it is durable and sturdy. This dollhouse is also great for playdates or siblings as it was specifically designed as an open-concept house that can be enjoyed by�several children at once. With nice open sides, low walls, and 6 large rooms, there's a ton of creative play space available in this lovely house. Add to that the swooping�graceful, flowing lines, and the warmth and beauty of native white pine, and you've got a gorgeous dollhouse addition for any playroom.�This new Maine Dollhouse is made safely with real solid pine wood and a non-toxic�linseed oil finish. Each dollhouse, like all Elves & Angels toys are shipped flat-pack in an effort to lessen the environmental impact of shipping.